ST PETERSBURG (Reuters) - Should France go on to win the World Cup on Sunday, they would have peaked perfectly after starting the tournament in Russia slowly but gaining momentum when it mattered most. Tournament experience has been key for both the players and coach Didier Deschamps, who has learnt lessons from the last World Cup in Brazil, where they lost to Germany in the quarter-final, and the disappointment of missing out on home soil in the European Championship two years ago. No more so than on Tuesday as they edged Belgium in the semi-final to put themselves within one game of a second World Cup win, 20 years after their first. While there were questions asked after a far-from-inspiring start, which included a controversial win over Australia and narrowly beating Peru, France still expectedly secured a knockout round spot early from a first round group where they were heavy favourites. They have looked better in each game. There were, however, no easy rides in the knockout stages where the French had to show their full capability in beating Argentina, Uruguay and then Belgium 1-0 in Tuesday's semi-final at Saint Petersburg. 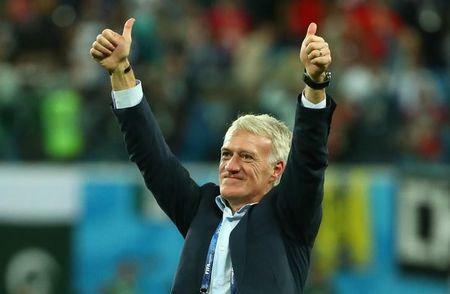 "We have prepared well, I can brag a little about that," laughed Deschamps after securing a place in Sunday's final in Moscow against either Croatia or England. "The older players all played their role as leaders and the youngsters brought their energy. I have a squad with a good blend. They have co-habited happily together. "No one complains and they all realise the importance of the competition. When there was an opportunity to be seized, they took it." There have been many positive aspects to their game. A lack of panic when they were 2-1 down against Argentina in the last-16 before coming back to win a thriller 4-3, and patience in breaking down stubborn Uruguay in the quarter-finals. Against Belgium on Tuesday, France were watchful and disciplined. "We have to give a lot of credit to the way France defended, even having certain attacking players defending very deep and giving us a lot of respect in that way," said opposing coach Roberto Martinez. "It was very difficult to accept what happened two years ago, and we do not want it to happen again. We want to finish this tournament in the best possible way," said captain Hugo Lloris after another series of heroic saves on Tuesday. Deschamps, who captained France's only World Cup winning side in 1998, said the march to Sunday's final has been underpinned by a steely determination. "There is a spirit in the squad that can move mountains," he said. "They are young and they will be even stronger in two and four years' time. "We have created an opportunity to become world champions but we are still not there. But we want to fulfill our destiny."